Discover how to play real money keno over your Web browser. What is instant play keno? Instant-play keno brings Australia’s favourite lotto game from the pub to your Web browser. Undoubtedly the best version of keno on offer, instant-play online keno offers the fun and accessibility of any land-based and software-based variant, but with the added convenience of browser-based play without the need to download anything. Fast, reliable and safe, instant-play keno is Australia’s favourite quick-draw lotto, and for good reason. Why is instant-play keno the best keno? The best thing about instant-play keno is it offers the excitement of keno at any time of day, without the hassle of having to download software or visit a casino. Keno once used to be found exclusively in land-based casinos and custom-made keno lounges, but with the rise of the internet came the surge of 24/7 keno. Saying online instant-play keno is easy to play would be an understatement. There are only two things you need: an internet connection and a computer. Keno games at land-based casinos require a minimum deposit on each game or “lot”, but the beauty of online keno is you can play for free before diving in with real money. You also won’t need to sign up to play the free version, making online keno a great game for casual players looking to test their luck for fun. Once you have the basics organised, all you need to do is pick an online keno game from one of our recommended casino sites and load the game in your browser. Each of our favourite online keno games are instant-play and don’t require demanding software with big download sizes to play. When we say “instant-play”, we mean it: there are no downloads, just a quick load in your browser and you’re off playing online keno for fun or real money! Online keno is played the same way as keno games found in casinos and lounges. The goal is to select between 1 to 10 numbers from a range of generally 80 numbers on the Keno card, and have as many of those numbers match the 20 drawn numbers, known as a “catch”. The more numbers you select, the higher the maximum prize. Marking only two numbers, for example, might have a maximum prize of $35 if both are chosen, but choosing ten numbers can sometimes boost that grand prize up to $100,000 on a single bet. We recommend a number of great casino sites which offer as many as eight keno game variants, as well as live dealer keno. Instant-play keno is incredibly easy and safe to play online. It uses random number generator (RNG) technology to produce outcomes with random number combinations. The technology has been used for decades in land-based casinos, generally in pokies machines and video poker. With the rise of online casinos, RNGs have been utilised to produce truly random number outcomes, keeping games fair and enjoyable. This technology has allowed game developers to experiment and create elaborate and innovative gaming experiences. It simply controls the entire outcome process, determining whether a player is a winner or a losing based on the number generated. In the case of online keno, the numbers selected by the RNG in every game are entirely random. The RNGs used for these games have to process quintillions of different number combinations — yes, quintillions! — and so all 20 numbers are instantly matched next to the numbers you have selected. You might be tempted to stick with a set selection of numbers, and you certainly can if those are your lucky digits. However, RNGs do not make a win/no-win decision. These generators never decide when your 10 numbers will be selected, or in which order they’ll be selected. Every ten-number selection you make has the same odds of winning as any other combination. RNGs select numbers at random, and if your combination happens to come up, you win. This means the process of selection in instant-play keno is exactly the same as a a ball machine used in land-based casinos for keno and bingo: the numbers are chosen at random, and all combinations offer the same odds. 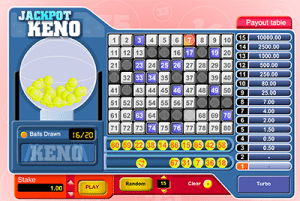 Online keno games offer some fun variations on the typical game format you’ll find in pub keno. Games are provided by some of the biggest names in online casino software, with plenty of variety to keep Aussie players entertained. Traditional Keno: This keno game offers a Vegas theme with an 80 number card, 20 drawn numbers and 10 selections. 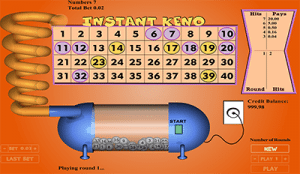 Instant Keno: Similar to traditional keno in it is an 80/20/10 game, instant keno has a bingo-styled theme. Krazy Keno: This keno game has a 40-number drum, with 20 draws and 10 selections. Bonus Keno: This game is like BetSoft’s Traditional Keno but with a key difference – a bonus round. You’ll select a minimum of two numbers and a maximum of 10 from an 80-number card. In each game, any random number can house a bonus, and you can collect five of these to earn a free game in which all wins are doubled (except the jackpot). Microgaming Keno: allows you to select up to 15 numbers on an 80-number card, which significantly increases your chances of winning the jackpot, with a top jackpot $15,000. 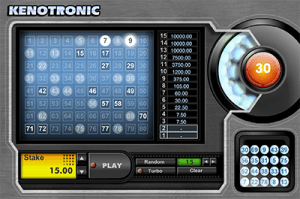 In addition to Microgaming’s keno, Emu Casino also offers some intriguing and unusual keno variants from various software providers, including Keno Kick Off, Kenotronic, Jackpot Keno and Keno Lab. This game is played with a live dealer selecting the balls from a hopper. It’s played on an 80-number card with 20 balls called and up to 8 balls selected by the player. Betting ranges from $1 up to a $50 maximum. Sign up to G’Day Casino today to play Ezugi Keno and receive a $1500 Welcome Bonus. Can instant-play keno be played on my smartphone? Although instant-play keno is Flash based and theoretically available for mobile play, it’s not typically offered at any of our recommended mobile casinos, with portable casinos favouring more popular games like pokies, blackjack, roulette and video poker. The popularity of mobile gambling is growing rapidly, so we expect to find mobile optimised keno games at these venues on the very near future, so check back regularly using your smartphone or tablet to see if your favourite keno game is available for real money play on the go. Sign up to enjoy instant-play keno at G’day Casino and claim an unlimited matched deposit bonus when making a real money account for the first time, with an additional $500 bonus available on your second and third deposits. You’ll find AUD keno games here from BetSoft, NetEnt and Ezugi.